PSNews - A delegation of the Vietnam National Art Troupe led by Mr. Vo Van Phuong, Member of the Party Central Committee, Deputy Chairman of the Communist Party of Vietnam (CPV) Central Committee’s Commission for Information and Education has completed a five-day visit to the Democratic People’s Republic of Korea (DPRK). PSNews - "Canh sat hinh su" (Criminal Police), the criminal investigation series that has been marked in the hearts of many generations of audiences, will officially make a return with a new 30-episode series named "Me cung" (Maze). PSNews - During five days of the 8th Southern Traditional Cake Festival in the Mekong Delta city of Can Tho, over 600,000 visitors spent their time to enjoy good food and other unique art performances. PSNews - UNESCO’s Executive Board Meeting on April 16 has approved Vietnam’s proposal for commemorating the 650th anniversary of the death of renowned teacher Chu Van An in 2020, along with 48 of 71 other applications submitted by 41 countries. PSNews - The photo contest creates a favourable condition for professional and amateur photographers to show their amazing photography skills by contributing beautiful photos of Vietnamese border from above. PSNews - The Ironman 70.3 Asian-Pacific Championship, taking place from May 9 to 12 in Da Nang, is expected to attract more than 2,200 athletes from 50 countries with the total prize pool is up to 75,000 USD. PSNews - 350 artisans from famous craft villages nationwide and 68 international artisans from 11 countries across the world will gather at Hue Traditional Craft Festival, contributing to enhancing an unique Vietnamese crafts festival. 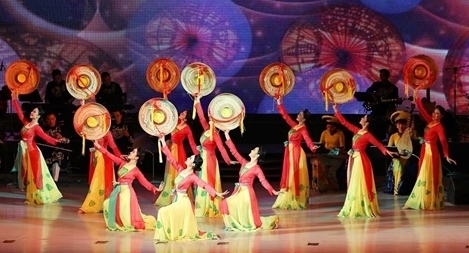 PSNews - The organizing board of Hue festival 2019 announced that, one of the festival's highlights named "Ao Dai through heritage path show" will take place, contributing to introducing Nguyen Dynasty art as well as honoring Vietnamese high-quality silk products. PSNews - Sebastien Ly, a famous French-Vietnamese choreographer, will reunite the capital audience with a contemporary dance called "Forgotten Gate". An exhibit of 30 paintings, mostly oil, by Vietnamese couple living in the US Nguyen Viet Nang and Bui Van Anh were on display recently in Hanoi. The exhibit, titled “Love will keep us alive” celebrated 30 years the couple has been in love and showed the couple’s love for Washington DC, their second home. Two Vietnamese towns, Da Lat in Lam Dong province and Sa Pa in Lao Cai province, have entered the new list of the 23 places in Asia to view the stunning spring season by MSN. In Vietnam, the janitor of a pagoda (or temple) is usually an elderly person respected by the local community, who is selected by the community to do the work for many years. But it is even harder to be selected for the job at many temples in the Hung Kings Temple historical site in the northern province of Phu Tho. The eighth annual Southern Traditional Cake Festival, slated for April 12-16, will aim to make a brand name for the tasty treats, the festival’s organiser has said. PSNews - Alexey Vovchenko (clarinet) and Alexey Kuznetsov (piano),amous Russian chamber artists left Hanoi art lovers with many special emotions when playing the classical masterpieces of the 19th century. According to professional British divers, Son Doong, the world's largest cave, may be bigger than previously thought, as a new underground tunnel was found recently. PSNews - The Russian Center for Science and Culture in Hanoi on April 9 held an art exchange between students of the Hanoi National University of Vietnam and Kurgan National University of Russia. Travel agents in Ho Chi Minh City are offering a huge range of domestic and outbound tours for the upcoming Reunification Day holiday on April 30 and Labour Day on May 1, and many of them are fully booked.